Happy New Year and welcome back to the TD courtyard!!! Speaking of the courtyard, our “photo of the week” is from TD senior and Froco Kaitlin Cardon and was taken back in September. 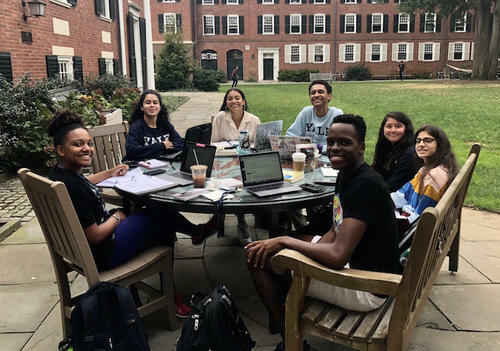 It features our wonderful first years “having a little study session in the courtyard.” So it maybe cold outside, but this photo will hopefully energize us to dive into the new spring 2019 semester! We have a lot of great events coming up in the next few weeks! First, please put on your calendars our spring TD Spring Community Night will be on Tuesday January 29th from 8:30-10:30pm. We will send out information for sign-ups soon so keep an eye out! TD First Years should have received a note from Dean Mahurin inviting you to participate in Fireside Chats at the TD house. Dean Mahurin and I have picked two dates – either Tuesday 1/22 or Monday 1/28 – and the sessions will take place at 7pm, 8pm, or 9pm. Click here for the link to the Doodle form if you still need to sign up. TD sophomores and juniors I am looking for volunteers to serve on separate committees to plan the Sophomore dinner and a Junior event for the spring. If you are interested, please email me at mary.lui@yale.edu. Looking ahead to February… TD is sponsoring 20 TDers to participate in the IRIS Run for Refugees 5K on Sunday 2/3 at 10am starting at Wilbur Cross High School in the East Rock neighborhood. Race proceeds go to support the wonderful work of IRIS (Integrated Refugee & Immigrant Services) throughout the greater New Haven area. If you are interested, please go to the registration site and enter coupon code “TDYALE” to have your entrance fee waived. Register at this link. It’s not too early to start thinking about this summer! Richter Fellowship applications are now live on the Yale Student Grants and Fellowships database. In addition to the Richter, TD also has the Bergin and Chubb fellowships. Please go to the grants website and type in “Timothy Dwight” to search for all of our fellowship applications. If you would like to talk out your summer plans and funding applications, please come to my TD office hours. This semester, I will hold my TD office hours on Wednesday and Friday afternoons from 1:30-3:30pm. Please email Karen McGovern at Karen.mcgovern@yale.edu to make an appointment. Look forward to talking with you! Calling all TD seniors! Kickoff your last semester at Yale with a wonderful sushi dinner courtesy of the expert sushi chefs from Sono Bana restaurant. They will be back in the house rolling their special creations! No rsvp needed! Our once a year event – when my amazing parents work with the TD Buttery team to make homemade dumplings – is back! There will be pork and veggie dumplings again this year. Don’t blink and don’t be late or else you will miss out! A new semester of the TD Orchestra begins! We’re coming off a terrific winter concert of Beethoven’s First Symphony and Tchaikovsky’s “Nutcracker” and would love to have more players join us. Feel free to invite a friend from another college if you like. If you’re interested, please email our wonderful conductor, Sarah Fox, at sarah.fox@yale.edu. CPA applications are available online! If you are planning to submit a CPA proposal for the spring 2019 semester, please make sure you submit your application by the 4pm deadline. The application site will be locked after that. Please note anyone interested in applying should send me an email at mary.lui@yale.edu to make an appointment to discuss the proposal. All first-years must sign up and attend a Fireside Chat on either evening – 1/22 or 1/28. If you haven’t already reserved your spot, please go to this link. Calling all knitters (and crocheters) or anyone interested in learning to knit! Come work on your project with other TDers! We will be having a knitting circle aimed at beginners on Friday, January 25th. Please fill out this form if you’re interested in joining us. If you don’t have a project yet, we will also be making a trip to Knit New Haven to buy some yarn, so fill out the form to schedule that. Needles, hot chocolate, and cookies will be supplied. For any questions, please email sumita.ghosh@yale.edu. Please don’t forget that Friday 1/18 will be following Monday’s class schedule because of MLK day on Monday 1/21. Yale’s businesses offices – including TD’s offices –will be closed on MLK day so make sure to plan accordingly! January 18, Friday: Friday classes do not meet; Monday classes meet instead. January 21, Monday: Martin Luther King Jr. Day; classes do not meet; dean’s office is closed. January 25, Friday: Examinations end, 5:30pm; winter recess begins. Deadline for all term papers and term projects. This deadline can be extended only by a Temporary Incomplete issued by your residential college dean (me again!). Info session Thursday, 1/17, from 6:00-7:00pm; 55 Whitney Avenue Room 220. Dinner will be served! the attendant educational consequences of these disparities. The program serves the related goals of structuring campus environments so that they will become more conducive to improved racial and ethnic relations, and of providing role models for all youth. The Edward A. Bouchet Undergraduate Fellowship Program welcomes all fields of study. Candidates may apply without regard to nationality or citizenship status. Both of these fellowships allow students to work on paid research projects during the academic year, and to pursue fulltime research during the summers between sophomore and junior years, and between junior and senior years. The Mellon Mays program also allows students to decrease their undergraduate and graduate educational loan obligations. Yale’s Roadtrip Nation: Based on the long-running PBS documentary series, OCS has licensed a database of thousands of real-world professionals’ stories. Build your own interactive Roadmap, access 5,000+ informational interview videos, and watch full Roadtrip documentaries, such as Women in STEM and First-Generation College Students. Access at roadtripnation.com/edu/yaleocs, and click ‘Create Account’ on the top right. You must use a yale.edu email address and subscription code YALE for full access.